It’s SO GOOD. I’ll be quiet while you just look at some pictures and let it sink in that there is not a brick holding up our stairs anymore!!! 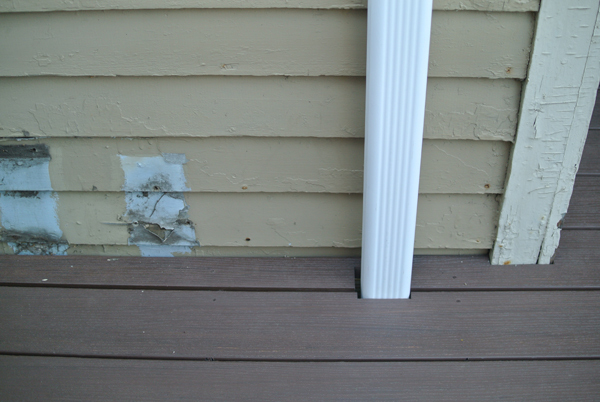 I love the attention to detail that our landscapers GreenSource put into everything they did, including notching out space for the electrical box, which couldn’t be moved, and the gutter. We couldn’t recommend them more if you’re in the Cleveland area. 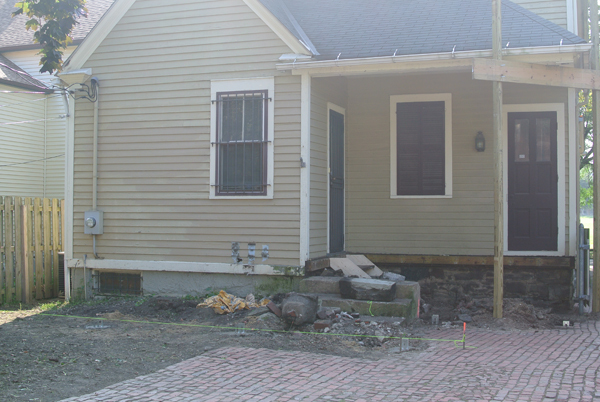 We decided to use decking by Azek because it is extremely low maintenance and long-lasting, and while it’s not natural wood it still looks really good, which was very important to us because of the historic nature of our house (it’s a registered neighborhood historic site). 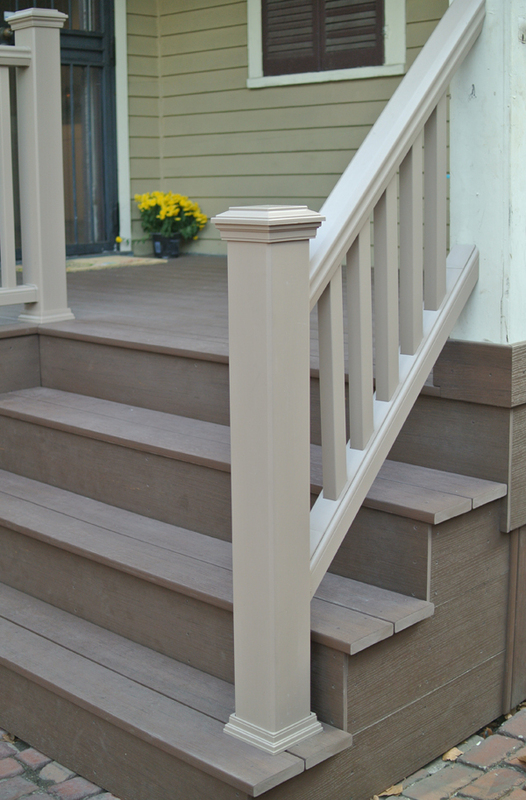 Technically Azek is not composite decking; it’s actually made from PVC, but don’t let that make you think it looks cheap or plastic-y. 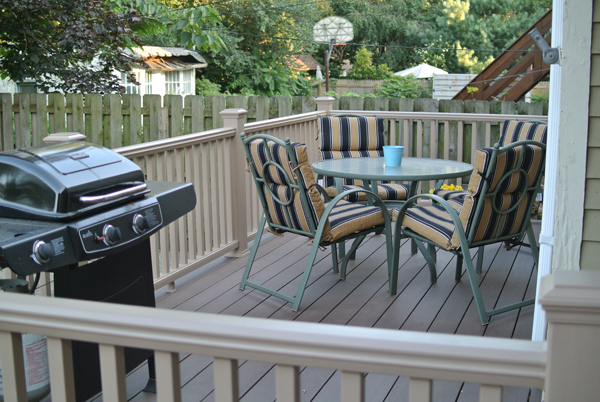 I think it looks great and is so much more sturdy than our old deck. It was also nice that the city was totally ok with us using it. 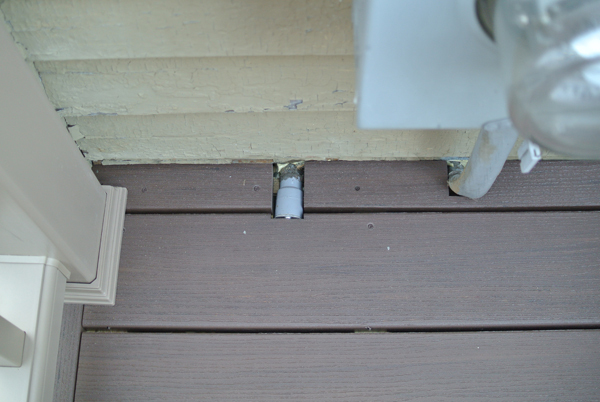 Our old deck was falling apart because it was built from wood and not maintained properly. We won’t have that problem with this one, and that makes the extra cost totally worth it long term. We also learned right away when our friends’ daughter drew on our new deck with crayon that it cleans really easily! Obviously the whole house needs to be repainted desperately. 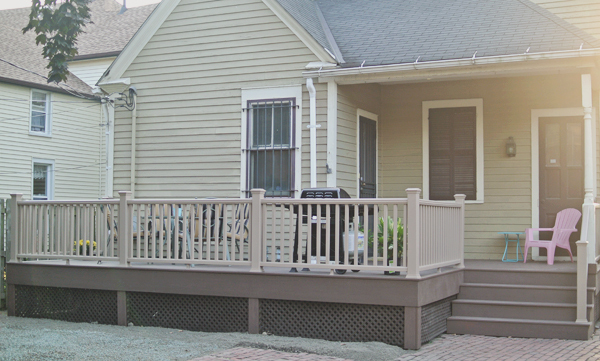 We want to match the house color to the new railing color, which we love. It’s similar enough to our existing color that it will still be historically appropriate to the age of our home, which is important to us. The trim will stay the same chocolate brown color. We’ll paint the garage to match, as well. As I mentioned yesterday, we want to open up the shutters on the window between the two doors. We’ll probably also want to add security bars to that window, which is sort of an unfortunate necessity around here, mostly to help me sleep better at night. We’re going to get some new deck furniture. Our current round table doesn’t fit very well so we’ll move it to the stone patio when that is built (next summer?). We debated about getting a new dining table, but then decided we’d like the deck to have a comfortable lounge feeling where we can hang out and eat on the couch — just like inside! We ordered an outdoor Valencia Sofa with a stone-colored Sunbrella cushion from Crate & Barrel (on super clearance!) which is being delivered next week. Next summer we’d like to add some more chairs so we have a nice conversation area when friends come over, but even on clearance outdoor furniture is crazy expensive, so we’ll need to save up for that. 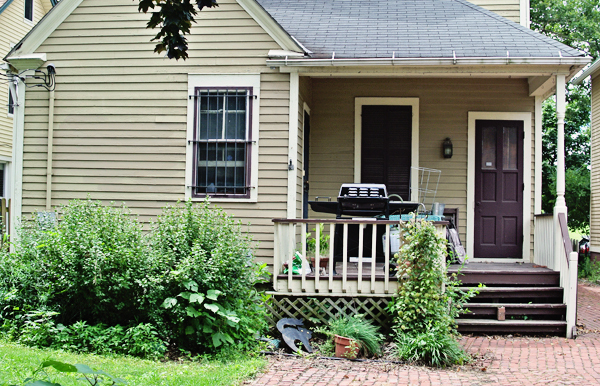 We’re also thinking about adding a trellis along the far left side, basically to provide a little privacy between us and our neighbor, for her benefit as much as ours. Right now our new deck looks down on hers, and we don’t want to feel rude when we’re out there, like we’re crashing her party. Plus I think a trellis would be really pretty covered in flowers in the summer. 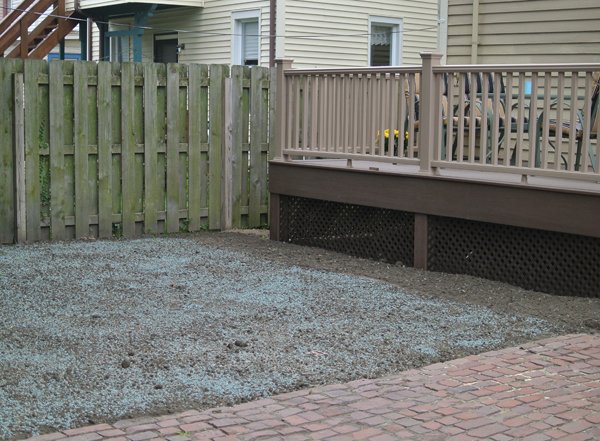 Speaking of flowers, the landscapers put a strip along the front of the deck that doesn’t have grass seed, just so we can just add mulch and probably some annuals next summer. We may decide to do flowers in pots or boxes so they’re easier to maintain. I’m thinking some bright geraniums would look so pretty here where there is plenty of sun. So there it is! What do you think of our new deck?! It’s a HUGE improvement, right?? I couldn’t be more happy with it, and I think this is one of the best improvements we’ve made in this house so far. I’m just sad that it’s getting too cool out to enjoy the deck as much as I’d like to. Can we rewind to summer please? !